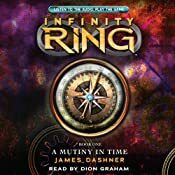 Quick Thoughts: The Infinity Ring series is a fun science fiction adventure tale, with some likeable kid protagonists, and full of things that would have enthralled me back in my middle school days. For adults, it’s definitely a bit cutesy, and some of the twists are quite obvious, but I think the interplay between Dak and Sera’s perceived history and the realities we are taught add a bit of intriguing mystery to the tale that makes the series stand out. 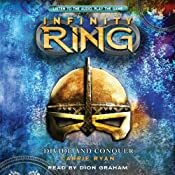 Set in an Alternate Timeline where history is slightly altered from our own, The Infinity Ring series tells the story of two brilliant kids Dak Smyth and Sera Froste, who manage to perfect Dak’s parents’ time travel device, and are sent on a mission to restore the timeline from the manipulations of a shadowy group. As the world falls into chaos, Dak and Sera along with a surly teenage language expert Riq, must discover the inconsistencies of the time line to restore order. The Infinity Ring series is a fun action filled time travel adventure perfect for children looking to learn about history outside of what you would read in a text book. There is an almost afternoon TV feel to the story, and I think adults will be able to have some fun with the series despite some rather simple character development and well telegraphed twists. I have listened to the first two novels, the first of which takes our heroes to the time of Columbus’s voyage across the Atlantic, which in their timeline is interrupted by a successful mutiny. What I found interesting about this first story was how Dak and Sera was forced to battle against history as they know it, which painted Columbus as the villain in their history. I actually enjoyed book two even more, due to its more obscure historical epoch, dealing with the Viking Invasion. I found the second book, Divide and Conquer, full of some truly fun and funny scenes, plus, a dog. I always like a dog. All together, I found both books to be fun a science fiction adventure tale, with some likeable kid protagonists, and full of things that would have enthralled me back in my middle school days. For adults, it’s definitely a bit cutesy, and some of the twists are quite obvious, but I think the interplay between Dak and Sera’s perceived history and the realities we’re taught add a bit of intriguing mystery to the tale that makes the series stand out. 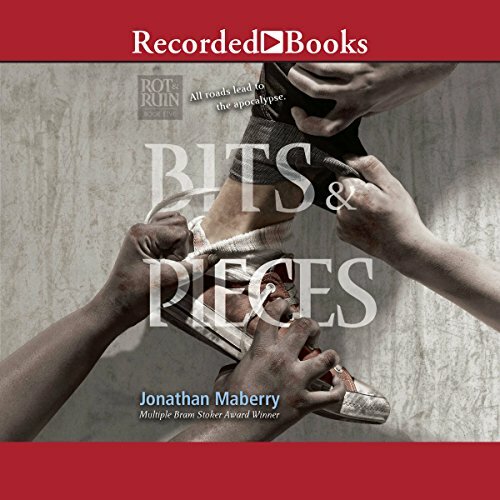 One of the big reasons I decided to check this out was that it was narrated by Dion Graham, and it’s so outside the typical Dion Graham audiobook experience I have had previously that I was intrigued to see if it would even work. Well, Graham brings such enthusiasm to the reading, infusing it with a sense of fun adventure. It’s not easy for adult narrators to voice kids, but Graham doesn’t go all squeaky and annoying, instead just puts a lot of energy into his voice, mimicking the competing enthusiasm and cynicism in children’s voices perfectly. The historical elements gives Graham a lot of opportunity to create various accents and characters which he takes full advantage of. There is a truly cinematic feel to his reading where all the characters come alive and you find yourself more than just a bystander but fully immersed in all the action and history. I’m not sure I would have enjoyed this series as much in print, but Graham adds so much to the story, you can’t help but sit back and enjoy the ride. Quick Thoughts: The start of a new series brings Pelecanos’ signature style to another well plotted crime tale, and Dion Graham’s narration perfectly delivers Peleconos’ words to the listener. This is a Pre-Release Title. The Cut will be released August 29th, 2011. George Pelecanos is one of the writers who changed the way I read crime fiction. I used to be in it solely for the mystery, to see if I could figure out the bad guy before the hero of the story did. For me it was an elaborate sort of puzzle. Sure, it helped if there were some interesting characters, fun suspense, and a couple of action scenes, but for the most part, I was racing towards the big reveal at the end of the novel. Yet, through Pelecanos and a few other authors, I began to realize that crime novels do not have to be about who-done-it. Often, it’s not much of a mystery who the bad guy is, yet, the why of the crime, the cultural influences that make up the mindset of the criminal and the investigator, and the setting itself offer much to the reader, if they are willing to embrace it. In The Cut, Pelecanos introduces us to a new series character, Spero Lucas. Raised in a multiracial adoptive home, Spero is still haunted by his time as a Marine in Iraq, and the death of his father while at war. Back stateside, he finds work as an unlicensed investigator for a criminal defense attorney. He also discovers he has a penchant for recovering lost objects. Spero is mostly satisfied in his simple life, enjoying what pleasures he can find in quality food, fine women, and good music. Yet, everything begins to go down hill when he accepts a job from a marijuana dealer awaiting trial to locate two missing “packages” that were stolen from his crew. Spero Lucas is quite an intriguing character. He operates in a sort of morally neutral space between the police and the criminals, not really embracing of rejecting either side. He views his job dispassionately, simply as a way to make money. Yet, he has a strong sense of family and loyalty to those he served with in Iraq. In Spero Lucas, Pelecanos has created the perfect character to filter his crime stories through, allowing us to determine the morally ambiguous characters from the downright evil. The beauty of Pelecanos’ writing is the way he makes his words flow, not through flowery language or some elitist verbosity, but a simple everyman sort of rhythm. His dialogue, both the inner dialogue of his characters and the external dialogue of the story has a poetic authenticity, full of slang and cultural references and a true understanding of how differing people communicate. Whether it’s two men comparing and contrasting their sexual status, or a couple discussing their musical preferences, the voices feel fresh, yet real. With Pelecanos writing style I would probably enjoy reading his tale of a families trip to the mall, but his writing is not a case of style saving substance. His plotting is lean and sharp, telling a story of crime and betrayal without taking unnecessary side trips. One thing I have always liked about Pelecanos’ stories is that we are not dealing with master criminals doing battle against brilliant agents of the law. These are simple men making their own decisions about what side of the law they will operate on, and what they are willing to do to achieve their ends. The Cut is a short fast tale of crime and its consequences, and the start of a series with a lot of potential. Pelecanos’ writing translates almost perfectly to audio. Dion Graham brilliantly captures the flow of Pelecanos’ words and dialogue. Graham’s voice resonates like urban poetry, with beautiful timing and perfect affectations. He doesn’t simply read the words, but performs them. Sometimes just a quick pause before an adjective will give the following word an added measure of importance which changes the feel of the sentence over a straight reading, and Graham perfects this method, giving more strength and personality to Pelecanos‘ words. It was almost as if he channeled Pelecanos’ characters, giving each not just it own voice, but its own sense of rhythm. Dion Graham does in The Cut, what only the best narrators do, enhance an already amazing book. For those who are only planning to read The Cut, in my opinion, you are missing the best way to experience Pelecanos’ language, which is through the voice of Dion Graham. 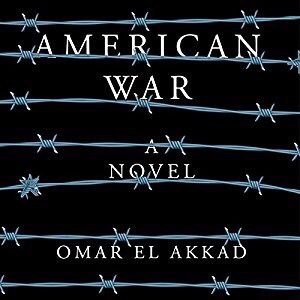 Note: A special thanks to the wonderful people of Hachette Audio for providing me with a review copy of this title.